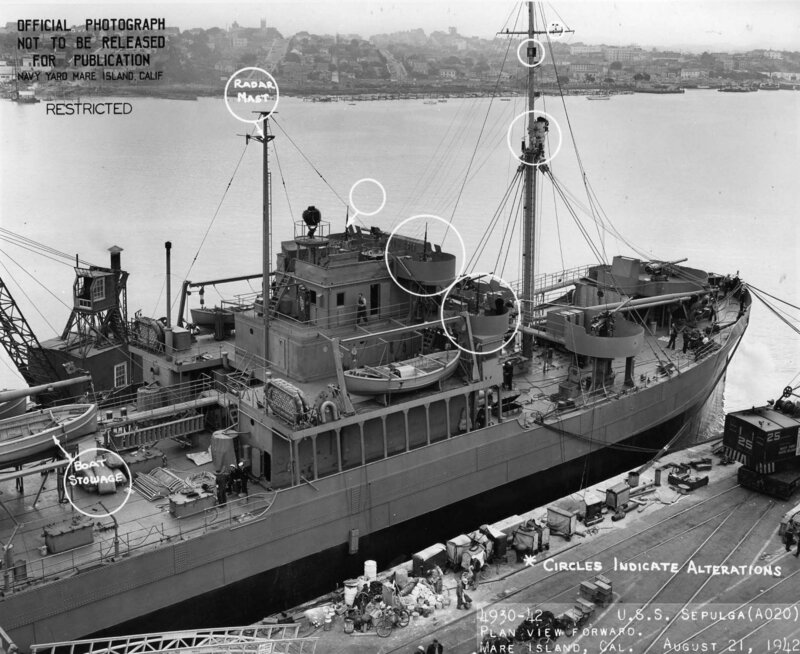 Laid down in fiscal year 1918 under United States Shipping Board (USSB contract # 1659) for the Emergency Fleet Corp., at Newport News Shipbuilding and Dry Dock, Co., Newport News, VA.
Decommissioned, 1 March 1946, at San Francisco, CA. 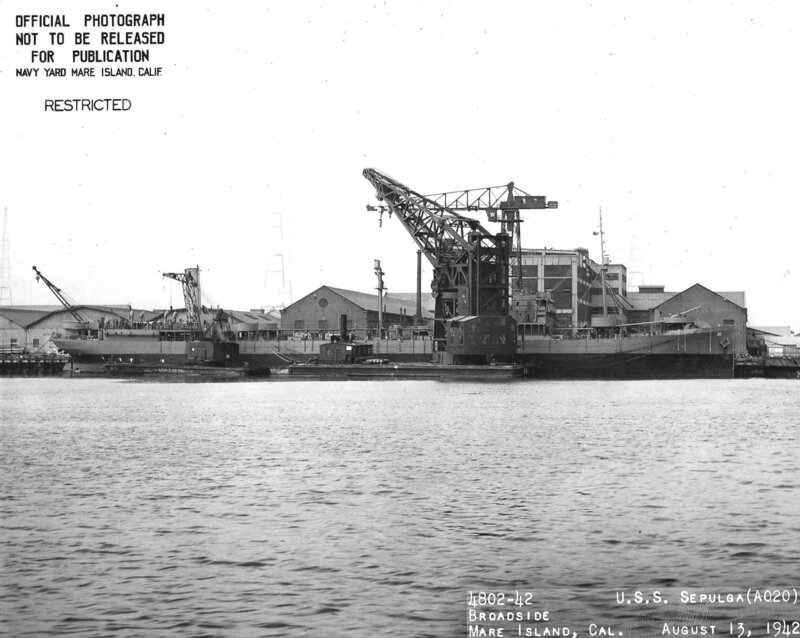 Final Disposition, sold for scrapping, 10 December 1946, to National Metal and Steel Co.
263k USS Sepulga (AO-20) moored outboard of cruiser USS Salem (CL-3) while laid up at Mare Island Navy Yard, CA., 11 April 1923. 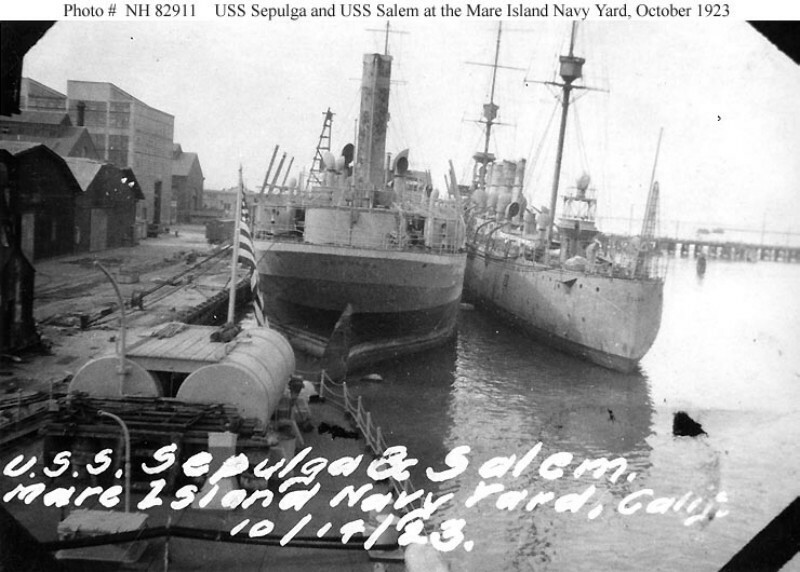 112k USS Sepulga (AO 20) center, is inboard of the cruiser USS Salem (CL-3) while laid up at Mare Island Navy Yard, CA., 14 October 1923. 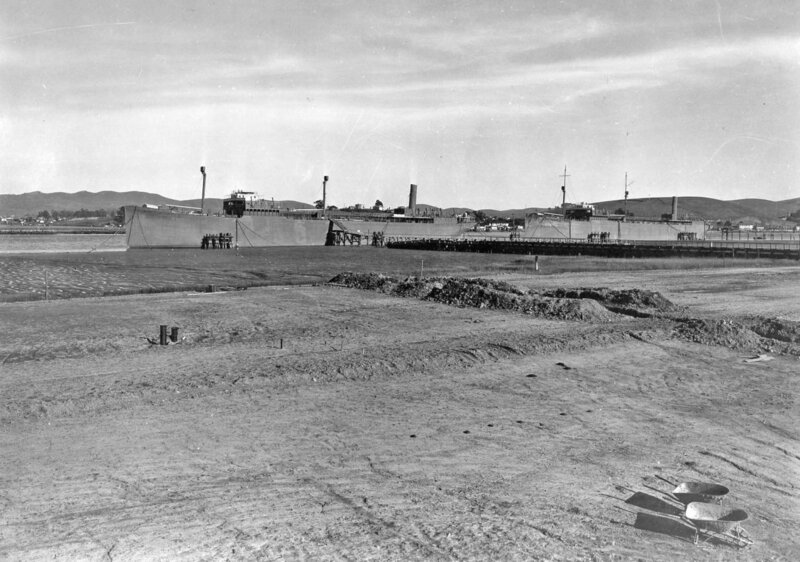 Photographed from USS Aroostook (CM-3), whose stern tanks are visible in the left foreground. 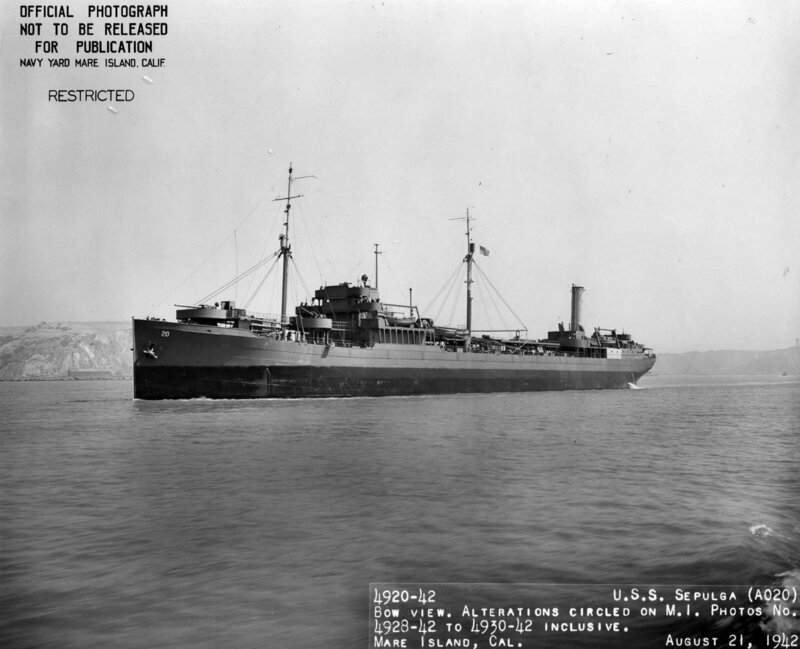 342k USS Sepulga (AO 20) is aft of USS Tippecanoe (AO-21) in reserve at the south end of Mare Island in 1930. 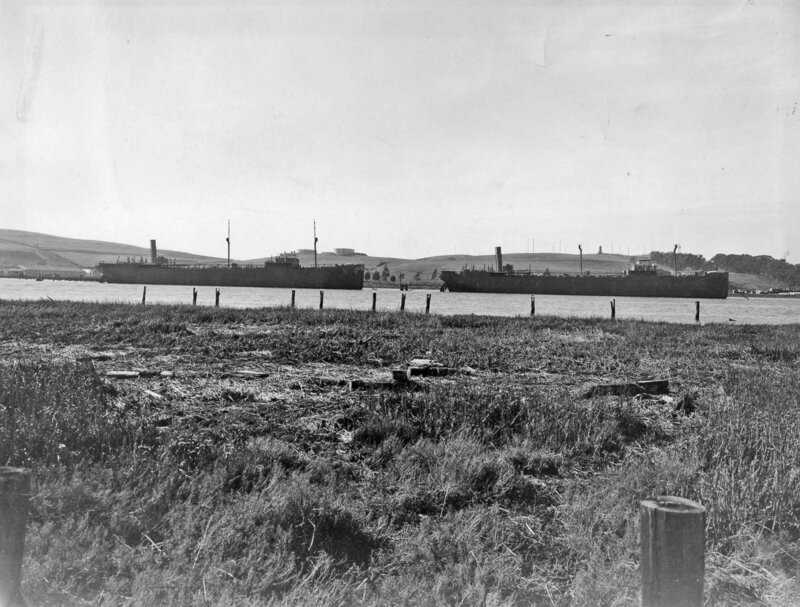 339k USS Sepulga (AO 20) is aft of USS Tippecanoe (AO-21) in reserve at the south end of Mare Island in 1930. 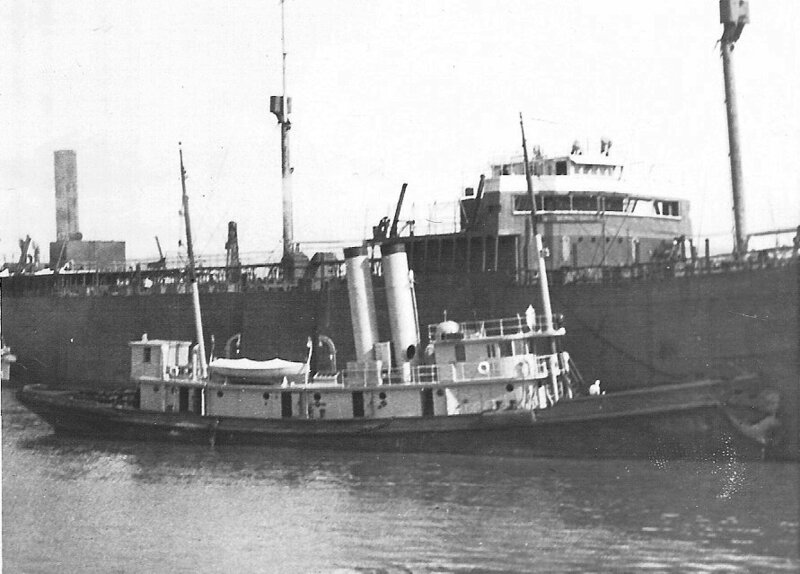 224k USS Sepulga (AO 20) is aft of USS Tippecanoe (AO-21) in reserve at the south end of Mare Island in 1930. 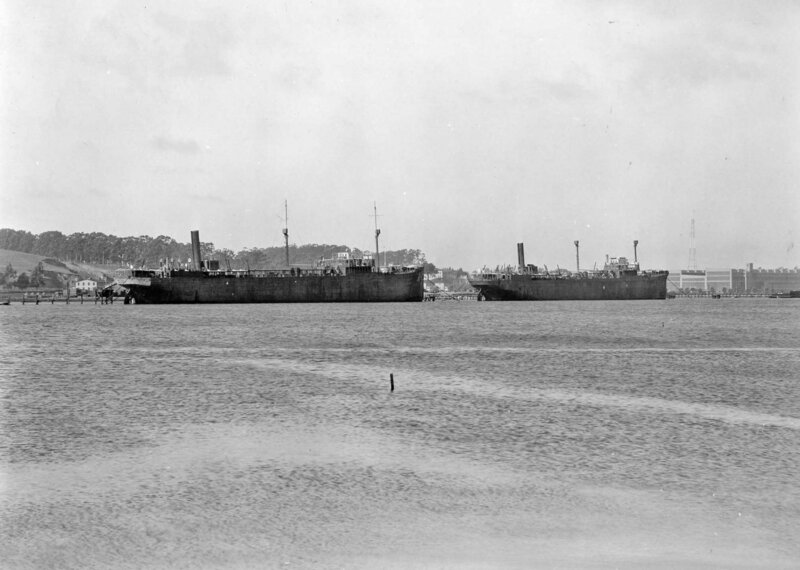 282k Broadside view of USS Sepulga (AO-20) at Mare Island Navy Yard, 13 August 1942 with YD-88 (left) and YD-33 (center) alongside. 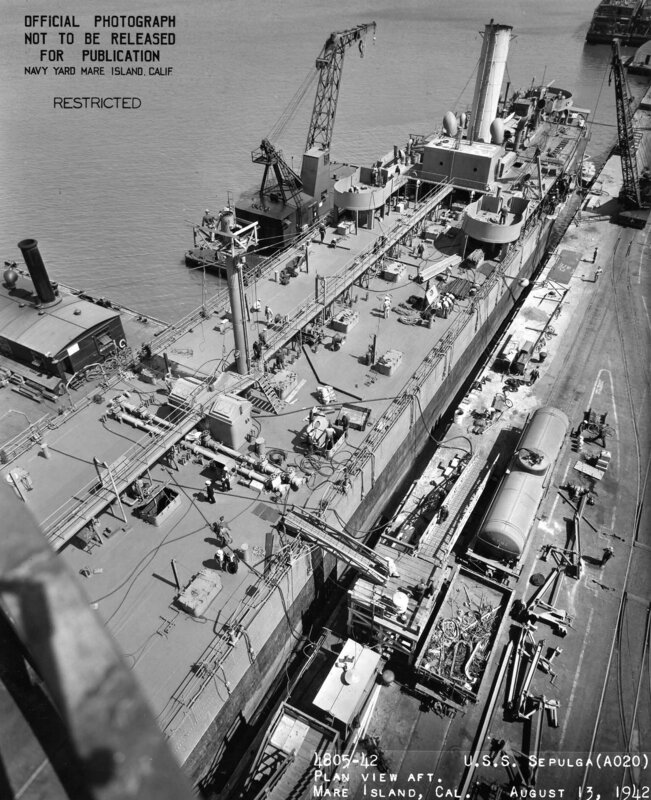 Sepulga was undergoing repairs at Mare Island from 10 to 21 August 1942. 483k Amidships looking aft plan view of USS Sepulga (AO-20) at Mare Island Navy Yard, 13 August 1942 with YD-88 alongside. 213k Forward starboard quarter view of USS Sepulga (AO-20) off Mare Island Navy Yard, 21 August 1942. 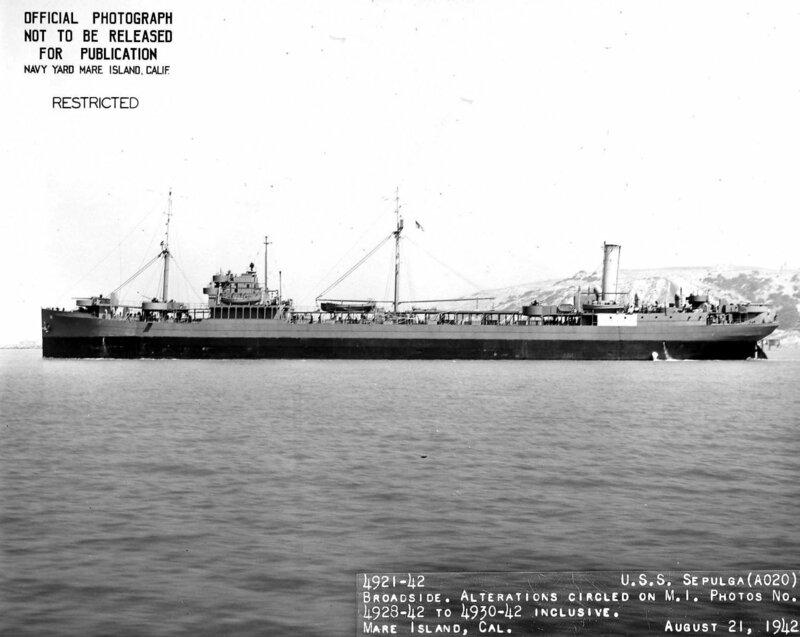 224k Broadside view of USS Sepulga (AO-20) off Mare Island Navy Yard, 21 August 1942. 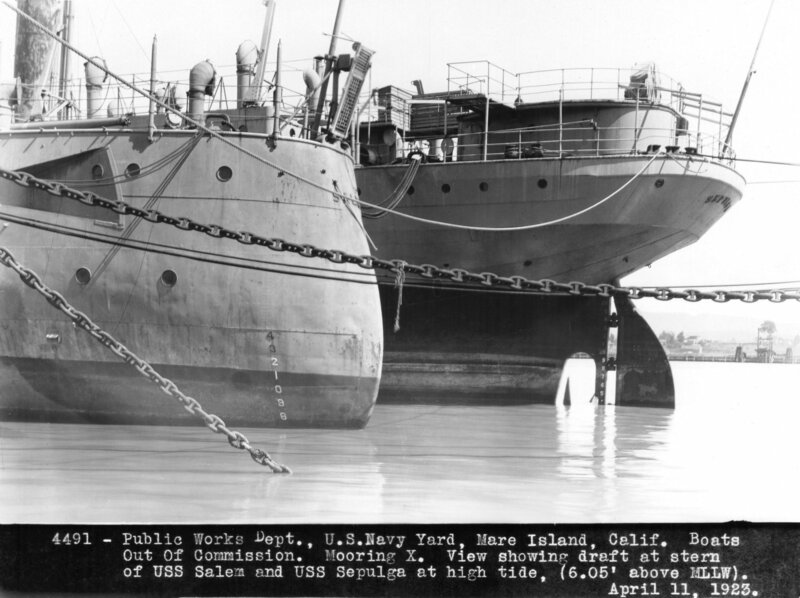 397k Stern plan view of USS Sepulga (AO-20) at Mare Island Navy Yard, 21 August 1942, with YD-88 alongside. 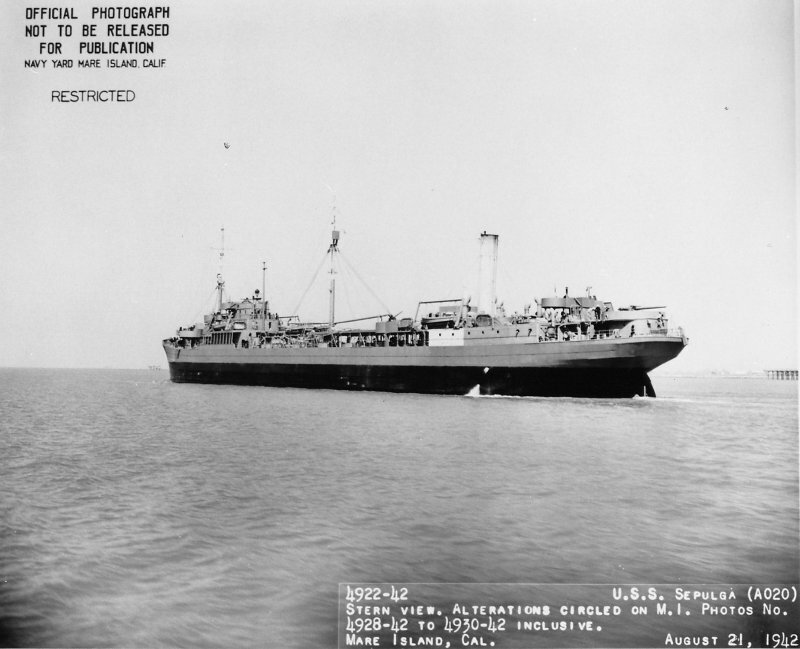 72k Aft port quarter view of USS Sepulga (AO-20) off Mare Island, 21 August 1942.